I have put together a story board of slides below to demonstrate how IT organisations can respond to the challenges of 2 speed IT and building Cloud competencies in a structured and timely way. 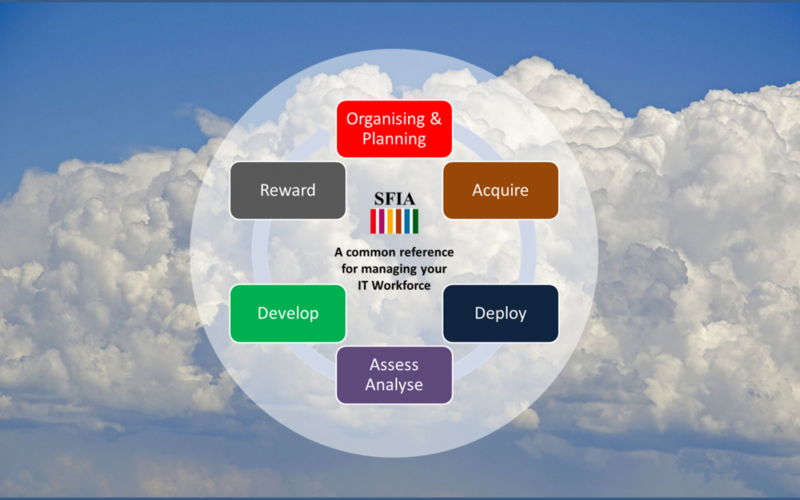 It includes using SFIA (Skills Framework for the Information Age) as a tool to help quickly plan, design, implement and manage your new IT organisation. With focused and intelligent use – SFIA will enable organisations to quickly cut through the jargon and hype and get clarity on their future people requirements and the gap from current to future state. A couple of articles on “Cloud Competencies” and “bimodal IT” highlighted the requirements for IT organisations to be more pro-active in managing the supply chain of skills in their organisations. Or, more bluntly – everyone is talking about a need for a shift in skills but what are organisations actually doing about it? SFIA, of course, provides a ready made, tool in helping forward thinking IT organisation design new organisations and then transition to and manage their future organisation. Whereas the industry can talk broadly about needing new skills & competencies this is not being backed up with the precision needed to clarify and quantify the gaps and then put in place actions to close those gaps. As a more practical alternative – the use of SFIA skills definitions and skill level definitions provides a much clearer view of what the gap is and ways to close those gaps. If IT organisations are not pro-active – they limit the options available to them in particular they can miss out on the opportunities to build the capability of their internal teams and instead they have to rely on expensive external resources to fill the gap. As well as being an additional cost this approach is inevitably de-motivating for the current team who feel they are being overlooked and not given the chance to grow their careers with their current employer. Finally – there is a reminder that formal IT training or IT certifications are NOT the answer to closing the skills gap – at best they will provide 10% of the required solution. Instead we need to putting in place a capability building programme which would also include opportunities to learning from others and learning on the job not just formal training.